With the summer months fast approaching, landscape architects and interior designers are busy creating designs that maximize outdoor settings and enhance public spaces in all kinds of environments. 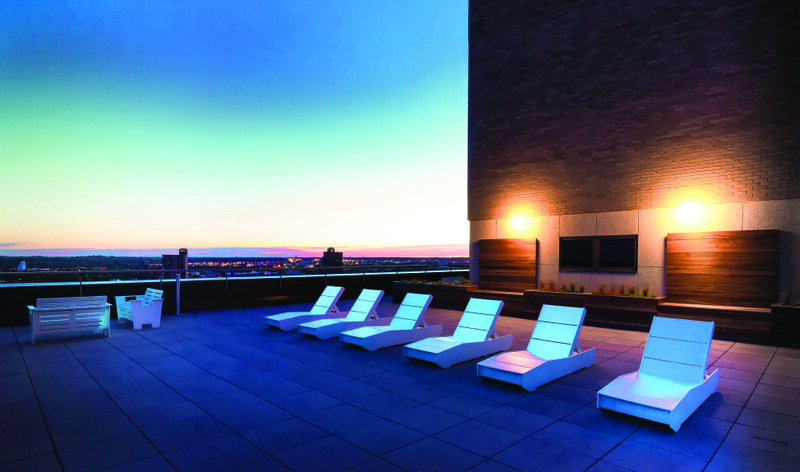 From rooftop patios and parks to urban streetscapes and downtown revitalization, Park Street Solutions offers modern street furniture and site amenities that will inspire landscape designers and complement any outdoor space. Park Street’s select manufacturers are all renowned for offering high quality landscape products that are expertly crafted to be durable and long lasting, while adding function and elegance to public spaces. Inspired by summer in the city, we’ve gathered our favourite outdoor street furniture and public site amenities that will get your creative juices flowing. 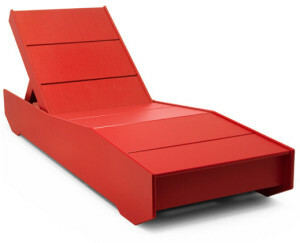 The 405 Chaise from Loll Designs is the perfect accent for a rooftop patio or for lounging poolside. Available in 10 vibrant colors, including Apple Red shown here, this lounge chair is constructed of recycled poly that is unaffected by wet conditions, lotions or spilled beverages. The movable back rest has five settings, including flat, and there is a convenient shelf exposed when the back is up that will help keep poolside accessories off the ground. The overall weight of The 405 Chaise will ensure it doesn’t blow into the pool and hidden wheels on one end make it easy to move. The Bala planter from Old Town Fiberglass shows off sleek, modern lines that are accentuated with classic undertones. The timeless quality of this design makes it perfect for streetscapes and high end commercial settings. 21 standard colours and a choice of four different finishes, including gloss, sand, matte and orange peel, allow you to tailor this product to perfectly complement any public space. 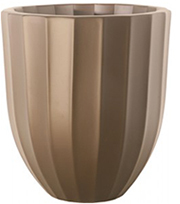 Pictured here is the Bala planter in Taupe with a matte finish. Contact Park Street Solutions to request samples of standard colours and finishes. Designed, engineered and manufactured with the same attention to detail, quality and durability that the design community has come to expect from Victor Stanley. 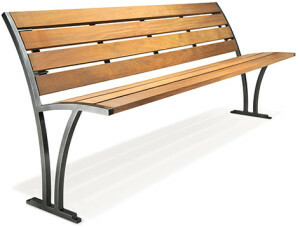 The Freesia bench from the Perenne collection of street furniture embodies elements in nature and features clean lines, natural proportions and a slim profile. Featuring solid 1″ square steel bar ends, options include horizontal steel slats, perforated steel seating or ipe wood slats as shown here. Intermediate armrests are available for horizontal or wood slat seating. Victor Stanley uses steel with 98% recycled content. 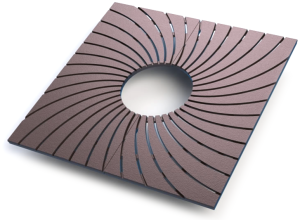 With over 30 standard sizes available across all product lines, Ironsmith has the largest selection of small opening tree grates. The Bond Street tree grate is available with up lights that will add an exciting dimension of night-time illumination to your streetscape. Light wells can also be used as access ports for irrigation. All Ironsmith tree grates are available in cast iron, aluminum or bronze and can be provided in a wide range of finishes. Widely used for its modern and rectangular European design, the Omega 10 fence system provides landscape architects and designers with maximum versatility for all public spaces. This unique pattern is made using a combination of flat vertical bars and round horizontal bars. 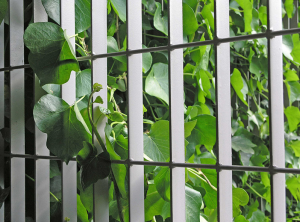 Vertical grating from Omega II Fence Systems provides cost-effective security and maintenance-free fencing comprised of rigid and secure electro-forge welded material.